Luckily, I remembered a cowl variation that I used to teach years ago, when my family owned a fabric store...The "Knotted" Cowl. Next, I made a quick trip to my ironing surface and gently pressed the pleat flat...yes, making a simple box pleat :) And that is just about all there is to it! Except for some very simple folding. Below is the tunic on my form, right sides out (photo lightened for clarity). Now, with just a little bit of tucking-under of the CF into the "dimple" (made when the bottom part of the pleat was left unsewn), there it is...a "knot" that's not a knot ! What follow is a series of photos to make the folding/tucking part of this design more clear-- All of the photos below can be Clicked to enlarge them. First of all, remember that the pin is ONLY here to hold up the first fold-down of the cowl collar, so that I can show what comes next...it has NO other purpose. When you make yours, you will not need that pin at all...it serves No construction purpose...I ONLY needed to put it there to show you what comes next. OK...the red circle in the photo above shows the "Hollow" or "Deep Dimple-like Hole" that was made by leaving the last 2" of the pleat NOT sewn (as demonstrated in the series of photos of the original tutorial). When you look closely at the photo above, you can "little fold edges" that show where the "Hollow/Dimple/Hole" is located. 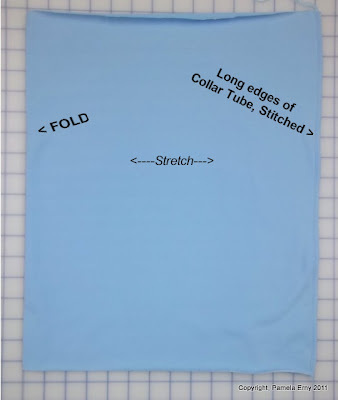 Now....to form the "False Knot", One Last Fold or it could be called a "Tuck and Roll-Under" needs to be made.... --click photo below to enlarge-- (Notice that the pin is NOT there now). As shown ABOVE by my crudely drawn arrows (sorry..best I could do).....So, as shown by those arrows, the LAST steps are to TURN and ROLL the edge of the collar UNDER ITSELF all the way arround, and THEN use the "DIMPLE/HOLLOW/HOLE" to hold the "Roll" in place, by "tucking-in/pushing" it INTO that 2-inch "DIMPLE/HOLLOW/HOLE" (shown above by the 2 double curved arrows at the center front). 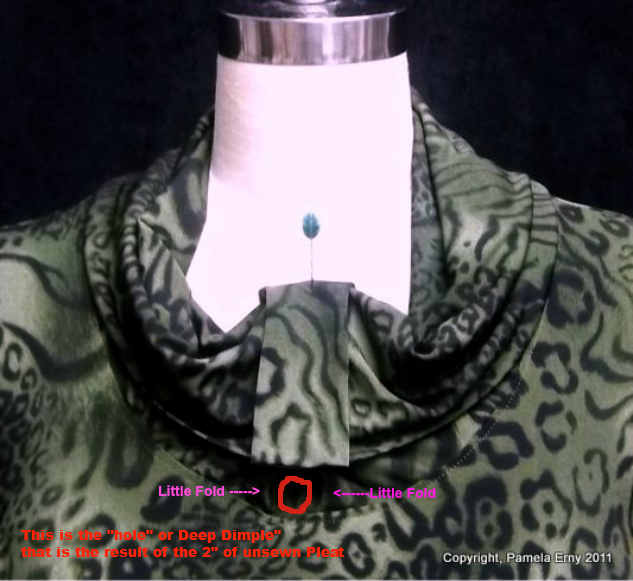 You can play with and arrange the folds of the collar that surround the Rolled-Under "Pleat That Now Looks Like a Knot" that has been tucked into the CF "Hole/Hollow/Dimple"...anyway you want to. Just make sure that the (pleated) Center Front of the COLLAR has been ROLLED UNDER ITSELF and Tucked-into the CF "hollow-dimple"
I hope that helps those who did not understand my first set of Tutorial instructions...I cannot think of any other ways to make this more clear than these extra instructions. Thanks so much for visiting my Blog. 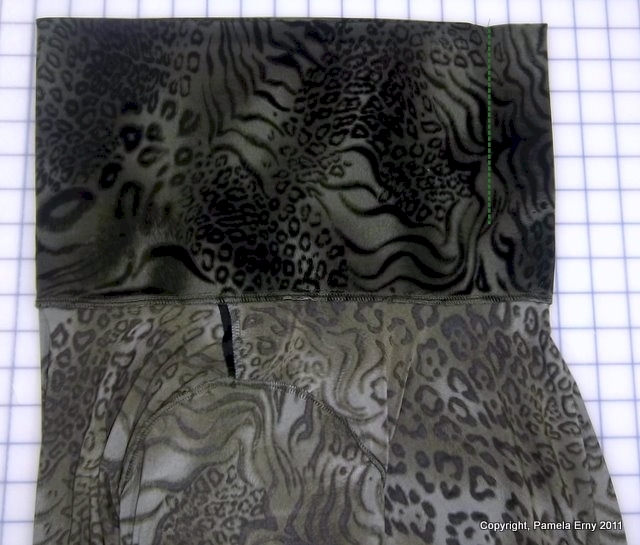 SEWING NOTES-- Fabric is a poly/lycra knit from Gorgeous Fabrics (purchased quite a while ago). 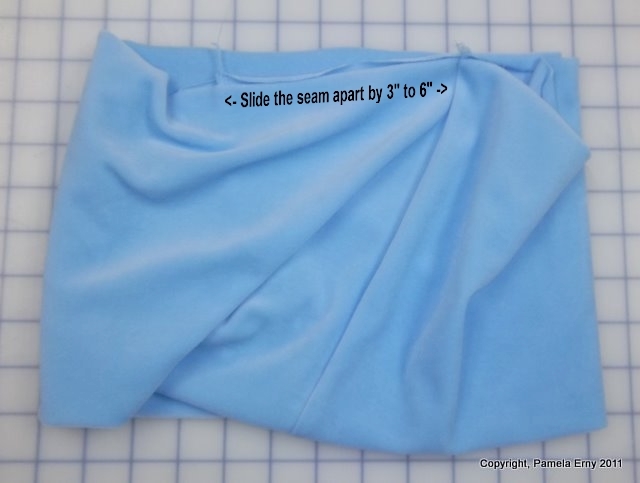 Shoulder Seams and Hems are stabilized with poly/lycra Pro-Tricot Fusible Interfacing from Fashion Sewing Supply. 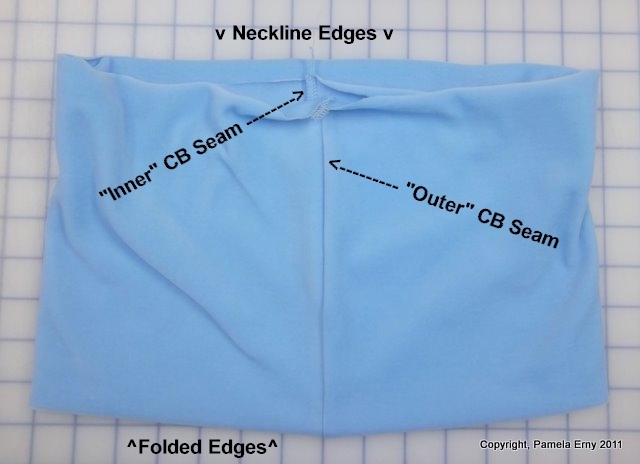 As promised, here is a tutorial for making a cowl collar that has been "Spiraled" so that it drapes in lovely gentle folds that hide the neckline seam, rather than just "flopping down" in the front. On a recent garment, I showed you the Spiral Cowl Collar on a drapey Rayon knit fabric...this blue one is made from heavy cotton/lycra knit Velour. Next, cut a cowl collar that measures 12"-20" Long x the Neckline Circumference + Seam Allowance. The stretch of the knit should run the WIDTH of the collar. and stitch the long edges together, forming a "tube". Then turn the tube right sides out, folding it in half to enclose the seam allowances. It will look like this, a "regular" cowl collar that we have all seen before :) The seam is the Center Back of the Collar, and it has 2 layers..the inner layer and outer layer. 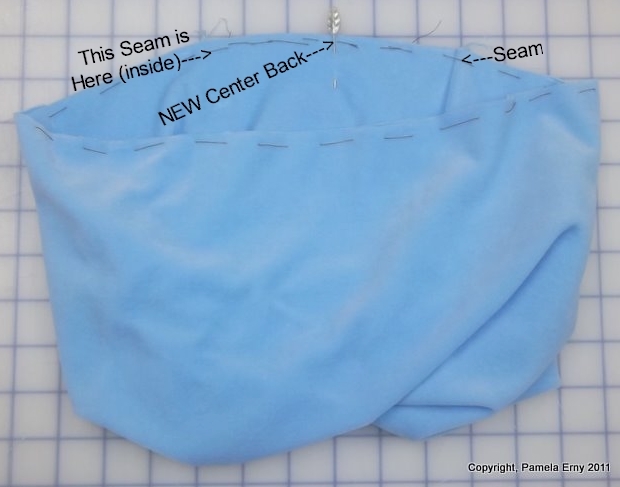 Next we will start to "Spiral" the Cowl Collar, by sliding the INNER CB seam and the OUTER CB seam APART by 3"-6"
Now just ignore that the Center Back seam allowances are no longer laying on top of each other, and match and join the cut edges of the collar together. Match them all the way around, ignoring the way that the folded edge of the Collar will "Spiral" :) You can join the edges by pinning them, or as I usually do, by running a quick line of basting. by placing a pin 1/2 way between the seams that were spread apart, as shown below. To attach the Spiraled Cowl Collar to the neckline of your top, start by marking both the collar and the neckline edge at their 4 "quarter-points" with pins. Then drop the Collar inside the Neckline edge, Right Sides Together, matching the center back point of the Spiral Cowl Collar to the center back of the Neckline. Then match the center fronts, and lastly the side points. Stitch the collar to the neckline. Turn the bodice right-sides-out, and finish sewing the rest of your top. Your collar will look something like this from the front (depending on how you arrange the folds). I hope you all enjoy creating your own "Spiraled Cowl" !